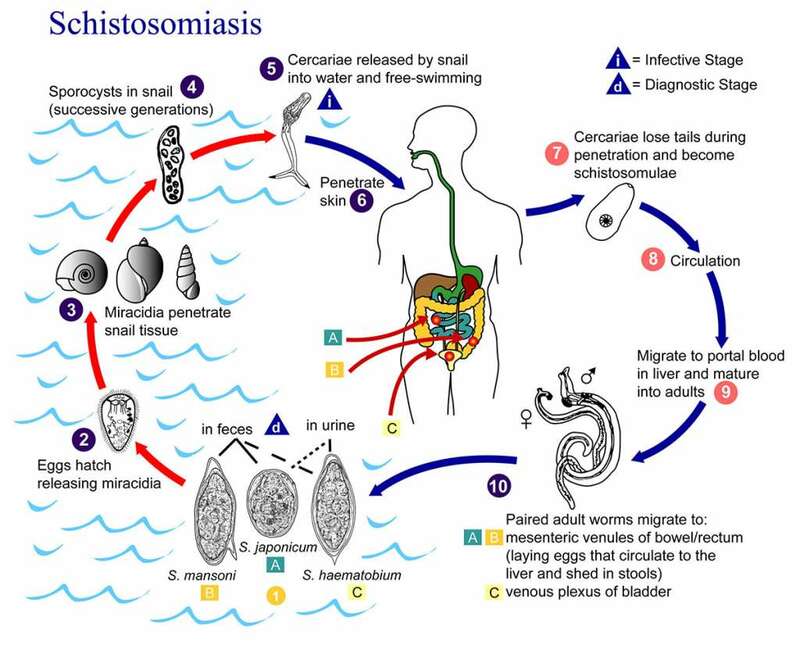 Figure 1: The disease transmission cycle for schistosomiasis. This image is a work of the United States Department of Health and Human Services, taken or made as part of that person’s official duties. As a work of the US Federal Government, the image is in the public domain. Schistosomiasis, also known as bilharzia or “snail fever,” is a parasitic disease carried by fresh water snails infected with one of the five varieties of the parasite Schistosoma. Schistosomiasis infects 240 million people in as many as 78 countries, with approximately 90% of the burden occurring in Africa. Schistosomiasis ranks second only to malaria as the most common parasitic disease. There are two types of schistosomiasis, intestinal and urogenital, which are caused by five main species of schistosoma (Table 1). However, despite their different geographical nature, all species are contracted in the same way, through direct contact with infested fresh water. With respect to risk populations, schistosomiasis particularly affects agricultural and fishing populations. Women carrying out domestic chores in infested water, such as washing clothes, are also at risk. In addition where there is inadequate access to safe drinking water and adequate sanitation, this only serves to amplify the problem. Interestingly, it is the migration to urban areas and the movement of refugees that is leading to the introduction of this disease to new areas. The resulting increase in population size and subsequent needs for power and water, have led to increased transmission. In addition, with the rise of tourism and travel, more people are travelling to countries with poor sanitation and a limited infrastructure. Therefore, an increased number of tourists are contracting schistosomiasis, often presenting with severe acute infections. It is during contact with infected water that transmission to humans begins, when the larva or cercariae of the parasite are released into the water by freshwater snails, until they come into contact with an individual and penetrate the skin. Once inside the body, the larvae develop into male and female worms that pair up and live together in the blood vessels for years, with schistosoma haematobium travelling to the vesicle plexus (veins of the bladder). Female worms release thousands of eggs, about 50% of the eggs are excreted either in urine of faeces, but the rest become trapped in body tissues where they cause immune reactions and damage to organs. Urogenital schistosomiasis causes scarring and tearing of the bladder and kidneys, and can lead to bladder cancer. As a direct result of this infection process, squamous cell carcinoma (SCC) of the bladder remains the most common presentation of this type of bladder cancer. In infected individuals, urinating or defecate in freshwater, the excreted eggs migrate to snails where they eventually hatch and the whole cycle begins again (Figure 1). In the management of urogenital schistosomiasis, any individual with evidence of infection should be treated, as adult worms can live for many years and it is often difficult to distinguish between active and previous infection. Treatment should of course be prioritised based on presenting symptoms and medical need. Biltricide (Praziquantel), an oral medication, has been shown to be effective against all forms of schistosomiasis and has few side-effects. It has low reported toxicity and no important long-term side-effects have been reported .Importantly its use in children and pregnant women is also considered to be safe. Importantly, education is required about risks of getting infected advising people not to swim, stand, wade or bathe in untreated water. Improved water and sanitation and breaking the lifecycle of the disease by encouraging the use of latrines and standpipes are also needed. From the perspective of a nurse assessment, considering a patient’s travel history or tracing their movements in any known areas of endemic disease are a key part of history-taking when presented with symptoms that may give rise to a suspicion of urogenital schistosomiasis. However, other conditions need to be excluded before an accurate diagnosis can be made. Schistosomiasis haematobium presents the greatest risk to the human urinary tract.